Mason students, faculty and administration will travel to Richmond on Thursday to speak with legislators about the need for more state funding (photo courtesy of Mason Student Government). 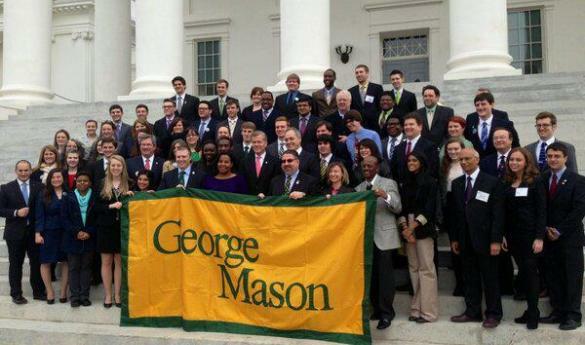 On Thursday, January 30, 2014, more than one hundred members of the George Mason community will travel down to the state capitol in Richmond, Virginia, for Mason Lobbies 2014. Mason Lobbies is a day of advocacy where students, faculty, staff, alumni, and administration join together to collectively advocate for Mason as “One Institution with One Voice.” The initiative was started last year with the goal of demonstrating the important investment that is George Mason University. By allowing the Mason community to speak to legislators, we remind them of the important role Mason plays in our great commonwealth, not only for students, but also for constituents and the private sector. In its second year, Mason Lobbies will build upon the success of last year’s event as well as identify specific legislative proposals that will benefit our institution. In building on conversations started last year, we will continue to focus on increasing state funding for our university. With this, one of our most important legislative priorities is an increase in financial aid funding. This work will be particularly important as the current budget before the Virginia General Assembly is slated to underfund state financial aid by $25 million. In addition, we support an increase in funding for university research as well as faculty and staff salaries. This will help us to ensure that our university remains academically competitive and will help to enhance the value of the Mason Graduate. Furthermore, one new legislative priority that will be added to the discussion this year includes providing in-state tuition for Dreamers. It has been a great pleasure to work with the Mason Student Government team, administrators, and faculty to put on this amazing event for the second year in a row and I am looking forward to a successful Mason Lobbies this year. Stay tuned to the @GeorgeMasonU twitter and #MasonLobbies for updates from Richmond on January 30, 2014.